Metamorphin' Assimilation Chess is a hybrid of my games Metamorph Chess and Assimilation Chess. As in Metamorph Chess, pieces may transform into other pieces. 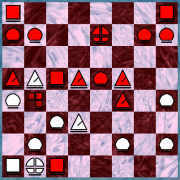 As in Fusion Chess, simple pieces may assimilate enemy simple pieces, and compound pieces may split apart. Although this is a hybrid game, it has a feature which sets it apart from its parents. It is possible to generate new pieces in this game. This is accomplished through the process of promoting to compound pieces (from Metamorph Chess) and splitting the compound pieces into their components (from Fusion Chess). Through the repetition of this process, more and more new pieces can be added to the game. However, your opponent will likely try to stop you from generating new pieces. So your ability to generate new pieces will often function more as a threat than as an actuality. Nevertheless, just having the ability to generate new pieces, even if it is never used, adds to the game a new set of gambits and tactics. When a simple piece (King, Knight, Bishop, or Rook) captures an enemy simple piece of a different type, they combine into a compound piece. The combined piece is the compound piece which moves as either of the two pieces just combined. Pawns and compound pieces may not combine with other pieces. If you have Zillions of Games, you may play Metamorphin' Assimilation Chess on your computer. Pictured on your left is the board used with Zillions. It was made from computer generated textures. It combines elements of the boards for Metamorph Chess and Assimilation Chess.